The patient is a 39-year-old woman with a 2.0 cm cervical polyp. 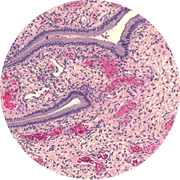 Sections show an endocervical polyp with mildly irregular glands which show tubal metaplasia. The stroma is increased adjacent to the glands without appreciable atypia. Rare mitotic figures are seen (0-1 per 10 high power fields). The polyp is remarkable for regions with central phylloidiform-like architecture and vague “cuffing” of stroma around the benign epithelium. Only mild stromal cell nuclear atypia is present. The atypical features are not sufficient for a diagnosis of adenosarcoma. The recommendation, however, is monitoring of the cervix and uterus to exclude regrowth.